As of 1 January 2019 the journal has been transferred to the new Publisher, Wolters Kluwer - Medknow. 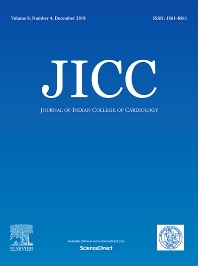 Journal of Indian College of Cardiology (JICC) aims to conduct and encourage preventive aspects of cardiovascular disease on a community basis. It focusses on bringing professionals of all specialties in cardiovascular medicine under one umbrella, and promotes exchange of their views and experiences. The topics covered in JICC include (but not limited to)coronary artery, valve disease, congenital heart defects, vascular surgery, myocardial and pericardial diseases, drug treatment, new diagnostic techniques, findings from the laboratory and large multi-center studies of new therapies. It also publishes symposia, clinical reviews/updates, editorials, and readers' comments.